Twitter the fastest growing micro-blogging platform with social networking feature now landed its SMS service in India with AirTel. India become the 5th country in the world to enjoy this service. Now you can post to your updates to twitter by sending sms at standard rates (max Rs. 1) and receive other's tweets for free by using AirTel sim card. For more text commands click here. 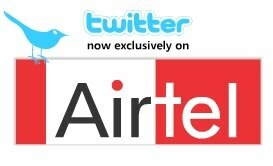 If you are not using AirTel service don't worry ; twitter will be available on your Vodafone/Idea/Reliance..... mobile just after one month as the contract is exclusively with AirTel for 4 weeks. I got my answers about twitting through airtel. You can use it for your blog's Twitter Marketing. this is a Very nice initiative by Airtel.